Flutter (8 lb.) & Tucker (7 1/2 lb) Due April 11, 2018. Expecting Solids and Piebalds carrying heavy for Cream and possibly Chocolate. 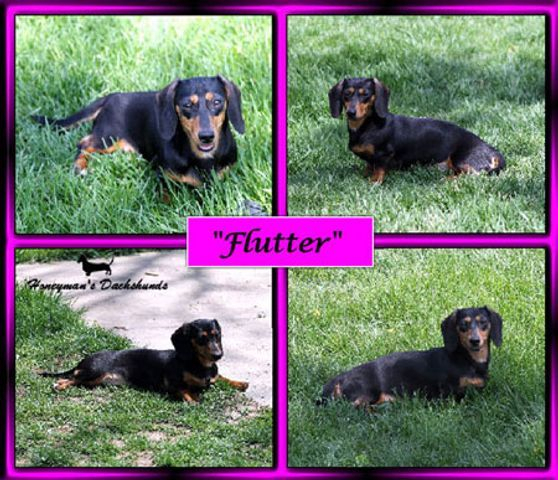 Dame: Honeyman's Flutterin' Butterfly Kisses (8 lbs) Flutter is a beautiful Balck & Tan Smooth Coat carrying for Chocolate, Cream & Piebald. She is our "Chewy's" Sister. She is our of our Retired "Honeyman's Silver Mist McFlurry" and a gorgeous little Black & Tan Male carrying a heavy cream factor "Triniti's Alexander The Great aka Zander". Zander's Grandfather is "Champion Cedar Hill's Hot Rod Harry". Champion Lines in her Pedigree: Do-Rae, Car-Rae, DD's, Cedar hill, Willowcroft, Techelwood, Rose Farm, Cedarhurst, Guardian & Foxfyre. Sire: Brock's Minted Kentucky Quarter aka "Tucker". 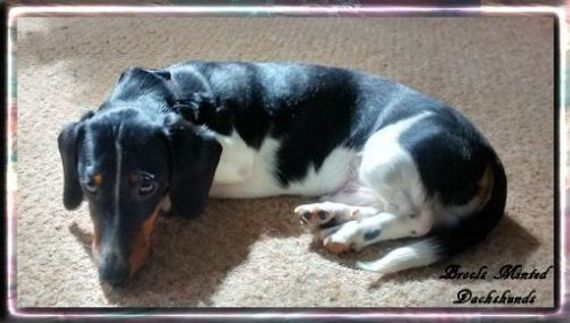 Tucker is handsome Black & Tan Smooth Coat Piebald carrying for Chocolate & Cream. Tucker is Champion Sired by "Hund Acres Red Radio Flyer v Rijo's. His Dame is our own Retired Carmella. Champion Lines in his Pedigree: Nuforest, Cindy-Ke's, Ej's, Ceedox, Chris Harbor, Prelude, Wee Walker, Follows, Farriers, Morgan Dox & Hanjo. Our Babies have been bred for conformation, health, longevity, and temperament. They are handled daily from Birth growing up well socialized and knowing they are much loved. They have been wormed regularly, have passed their last vet checks with flying colors, had their vaccinations to age, and will be doing well on potty pad training. All of our Babies are a bit spoiled and love to be held, loved on, and snuggled in our arms. They are handled daily from birth and every one of them loves giving kisses and are acclimated to toes already. When our puppies reach 3 1/2 - 4 weeks we move them and their Mother out of the whelping crate into a large puppy play pen in our living room. We spend alot of time with our Babies handling them daily from birth on. They are well associated with potty pad & paper training, acclimated well w/people, children, and other dogs & given lots of playtime, love & care. 2. I will continue to be happy to drive and meet my new Parent?s halfway for a reasonable delivery fee. I have driven up to 8 hours 1 way to meet new Parents. Prices Listed Will Be on Spay & Neuter Contract, for Companion/Pet. Show & Breeding Rights with AKC Registration which is given to a very limited few. Also, if interested in a puppy from us, please fill out our puppy application and send it to me as this will answer many questions I would have for you as new prospective Parents in advance. Also read through our Sales Agreement as this goes with every puppy we home.